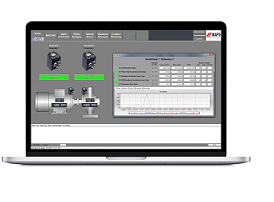 MAPS 4, the latest SCADA solution from Adroit Technologies for control and visualisation, extends connectivity options, adds user tools and increases the scope of its built-in functionality. The result is a software suite that can reduce the time taken for project development and integration, while also enabling users to realise Smart Factory objectives. Built on a strong Service Oriented Architecture (SOA), the full MAPS 4 process suite delivers flexibility in handling, automating, controlling, verifying and auditing processes. It provides a full life-cycle planning, management and integration platform for applications from manufacturing to infrastructure. There is also a dedicated HMI version available for machine builders and customers that require a more lightweight SCADA solution for localised control and visualisation tasks. The SCADA software suite has useful everyday features such as an MS Excel bulk-configuration tool. This tool for example enables Excel users to create a large part of a SCADA project, for instance Tag databases, logging, and alarm definitions, in an intuitive and easy to use environment. The user also benefits from the many copy/paste and mass-configuration functionalities in Excel. There are also extensive libraries for Mitsubishi Electric factory automation hardware and more than 100 other PLC and RTU drivers onboard to make routine configuration quicker and more efficient. Use of pre-configured Object Template models as well as easy creation of new, individual models also support a fast, optimised integration process. Project changes can be deployed centrally providing a single point of engineering that reduces costs and increases usability. Secure data sharing and cross platform connectivity are both high priorities for many process management applications. Therefore the SCADA solution can be hosted locally, in the cloud or privately. It can also be connected seamlessly to other third-party cloud hosted environments. Developed around popular industry standards such as OPC DA and UA, MQTT and BACNet, the entire software suite is effectively Industry 4.0 and IIoT ready. It combines the compatibility advantages of built-in OPC UA and DA support, with the openness of an HTML5 web client. Secure web connections provide easy browser-based monitoring and operation for PCs and mobile devices. The scope and scalability of the product mean that project engineering and development costs for both large and small applications can be significantly reduced. The amount of physical programming required is kept low, even when the complexity of the application increases. This has benefits for the end user and the system integrators as both can become more competitive as a result. The investment is also better secured because the solution remains very flexible for updates and new projects.